Ben will not be attending his 20-year reunion, however. He committed suicide in December of 2014. An open letter to members of the entire community of Collegeville, especially the Saint John’s Preparatory School Class of ‘65 Reunion Committee including Kevin Campbell, John Fogarty, Don Genereux, Al Rudolph, David Thorman and Ray Turcotte. Father Tom Andert, a 1965 graduate of Saint John’s Preparatory School is celebrating his 50th high school reunion this weekend. Andert is acting prior at Saint John’s Abbey in Collegeville, Minnesota. One of Father Tom Andert’s “alleged” victims, Ben, was a 1995 graduate of Saint John’s Prep School. Much of Father Andert’s history with Ben is well documented. In 2002, Abbot Klassen even offered to pay for Ben’s therapy – an arrangement brokered by another monk perpetrator. Ben’s class, the class of 1995, is celebrating its 20th class reunion this weekend. In one of Ben’s last email exchanges with me, Ben referred to the “horrible culture of hypocrisy” at Saint John’s. That hypocrisy will be on full display this weekend. At 4:30pm on Friday (June 26), Father Tom Andert will say mass for his classmates. Reunion committee, I respectfully urge you to request that a replacement be found. Not only is Andert not on restriction, he is currently prior at the abbey and is reportedly supervising the older monks who are under Safety Plans (for misconduct) at the abbey. When Abbot John Klassen is away from the abbey, Father Tom Andert is in charge. If something should happen to Abbot Klassen, Father Andert takes over. Perhaps that person is among your committee? Two former Prep School students recently recalled their experiences with Father Tom Andert. The students were classmates in the late 1970s. Neither graduated. Each reported that Father Tom Andert became a family friend. Each reported being pursued by Father Tom Andert. Each reported Father Tom Andert saying, “You’re the son I never had.” Each is deciding upon the best next step with regard to this matter. Ben’s story was no different. Ben was no stranger to Saint John’s Prep School when he entered as a sophomore in 1992. Father Tom Andert and Ben’s father were at the Prep School around the same time. Ben’s first stay at the Prep School was short lived, however. In early September of 1992, Ben called his parents. They were at an Elton John concert. Ben told his parents he was homesick and wanted to come home. Around Christmas, Ben decided that he would return to the Prep School. Unbeknownst to Ben’s parents, Father Tom Andert had been calling, and persuaded Ben to return to the Prep School. Over the next eighteen months, Andert and Ben spent far too much time together. Several Prep School staff members felt the relationship had become inappropriate. Until a few months ago, Ben’s parents didn’t know that Andert had been removed as headmaster due to his “relationship” with Ben – or that Ben’s suicide attempt took place the night before Father Andert’s replacement, Father Mark Thamert, was announced. Ben shared that he felt guilty for ruining Andert’s career. Ben felt guilty for bringing shame upon his family’s name. Ben felt guilty for not doing more. When Ben attempted suicide at the Prep School in February of 1994, Father Tom Andert was by his side almost immediately. Ben’s parents, unaware of the relationship, entrusted Father Tom Andert with their son. Father Tom Andert’s published love letters [ View ] began while Ben was still in the hospital – and as Father Andert was on his way out as headmaster at Saint John’s Preparatory School. 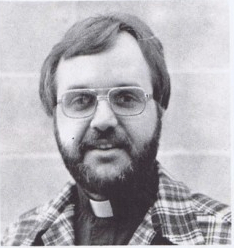 In October of 2005, Father Tom Andert’s relationship with Ben was reported to the Abbey’s External Review Board and brought to the attention of Abbot John Klassen. Abbot Klassen was lying. By 2006, the Ben/Andert story had been told at least twice. Ben’s parents reported Andert to Abbot Timothy Kelly in 1996. During those meetings, Ben’s parents were shamed and intimidated. Abbot Timothy Kelly, a credibly-accused perpetrator himself [ View ], discounted the accusations against Andert. Ben came forward again in 2002 to Abbot Klassen, with credibly-accused-monk-perpetrator Father Brennan Maiers working as Ben’s intermediator. 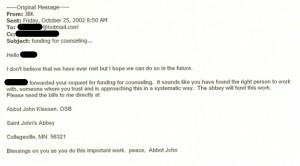 With Brennan’s help, Abbot Klassen agreed to pay for Ben’s counseling. “Brennan forwarded your request for funding for counseling. It sounds like you have found the right person to work with, someone whom you trust and is approaching this in a systematic way. The abbey will fund this work. Please send the bills to me directly… ” – Abbot John Klassen, October 25, 2002. At the time Klassen agreed to pay for Ben’s counseling (October 25, 2002) Father Tom Andert was a faculty resident at Metten Court, campus housing at Saint John’s University. Klassen did not replace Father Tom Andert as faculty resident. During our conversation, Ben shared Andert’s pursuit, the touching, hugging and kissing which took place for months. Ben shared that Andert changed his grades, pulled him from class, and providing alcohol to Ben, a minor, in Andert’s Prep School office. Ben shared a bit of what happened on a trip with his parents and Andert in Colorado in the summer of 1994. Ben shared that Andert had convinced his parents that they (Andert and Ben) should share a hotel room. With Ben’s parents in a room nearby, Andert came out of the shower wrapped in nothing but a towel. Ben shared his horror when Andert took off the towel. Ben didn’t share what happened next. He was too ashamed. Ben shared, and his parents confirmed, that sometime later that night, Ben made it to his parents’ hotel room and spent the night, terrified, between them. I, like many others, believe that Father Tom Andert’s pursuit of Ben, along with Abbot Kelly’s and Abbot Klassen’s failure to hold Father Andert accountable – combined with the abbey’s “horrible culture of hypocrisy” – contributed, if not directly led, to Ben’s suicide. To date, Abbot John Klassen has refused to take action. Perhaps he will listen to you, the Saint John’s Preparatory School’s Class of ‘65 Reunion Committee. It is time to shine a light on the horrible darkness that is Father Tom Andert. Please know that my commitment to the victims of misconduct and abuse by personnel at Saint John’s remains strong – as does my desire to hold those credibly accused accountable. I look forward to celebrating many future reunions with my classmates, the class of 1983, and to someday meet each of you.